Tambobong Beach in Dasol, Pangasinan. 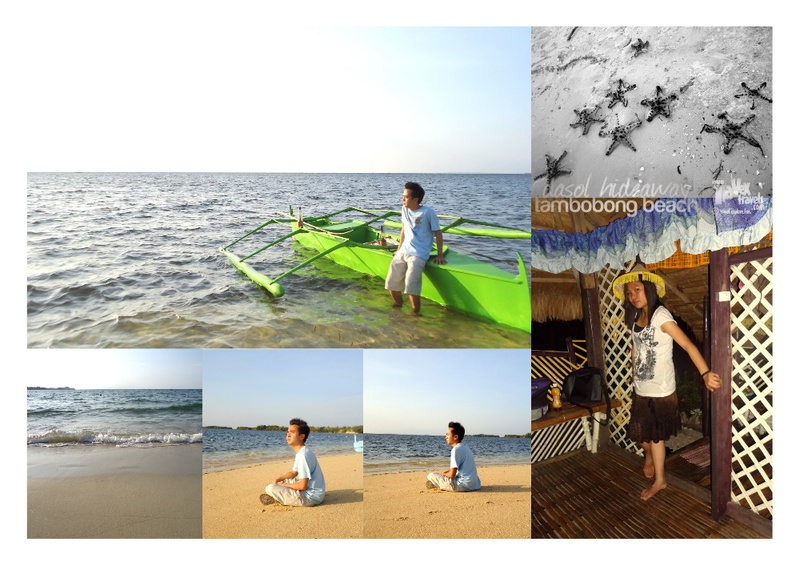 Tambobong Beach in Dasol, Pangasinan is an outskirt beach located around one hour from the nearest downtown of Burgos, Pangasinan. Tambobong Beach is a dirty-white sand beach, more of a soil-like color.The waters of the beach is said to be swimmable during high tide but during low tide, seagrasses appear. Tambobong Beach is also a fishing ground among local fishermen. The shores of this beach serve as the jump-off point to the other tourist destinations in Dasol, Pangasinan namely Crocodile Island, Balinmanok Cove, Culebra Island, a cave and a shipwreck. When one wants to be secluded in a serene beach, Tambobong Beach is a good place. Star fish exclusive in Dasol, Pangasinan. We started our trip at an assembly time of 8:00 in the morning. From Baguio, we rode a bus bound to Dagupan, and in Dagupan we rode a bus bound to Sta. Cruz (in Zambales) and dropped off at Burgos Public Market. We bought our food in the market (squid, eggplant, tomatoes, etc) and after that we hired two trikes (we should have hired only one trike, but the driver insisted to hire two trikes since we were five and we had a lot of things and bags). Regular fixed fare for trike is P300 so negotiate with the driver. Morning rush @ 6:30 A.M. in Tambobong Beach. The sands look white when the sun is already up. 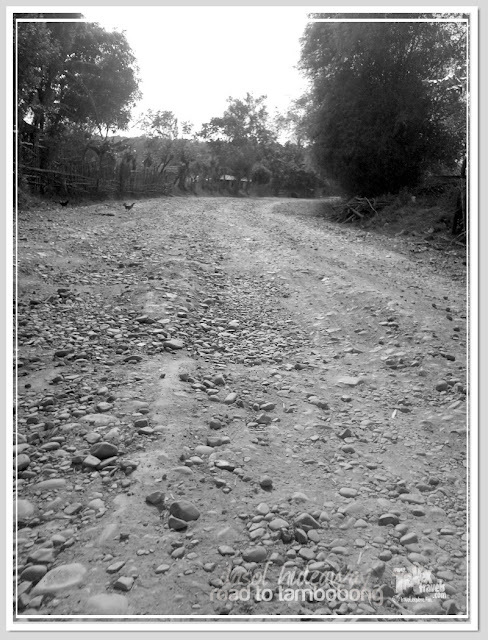 The road from Burgos to Tambobong takes you to an outskirt road, or a barrio road, which is halfway rocky path on some parts. The first miles of the road are concrete, but as soon as you get to the end of it, the road gets rougher. This is where you will experience a rural setting in the province—you will see vast lands of grasses, grazers freely roaming through the greeneries, and a simpler life people used to have there. When we had that one hour rocky road trip to Tambobong, I remember how simple my life used to be when I was still a child, back when I was still playing local games in my hometown in Tarlac. The contours of the hilly land meet the azure of the horizon. And you will eventually feel the sense of being lost to the trees and the nature—out of being divulged to the cities. The rocky road to Tambobong Beach. We were supposed to spend the night at Nanay Benilda’s homestay in Tambobong but my friends want to spend the night at a simple kubo so we were redirected to another person who owns a kubo for rent. I don’t recommend the kubo because we were billed too much (we paid P1200 for the kubo plus there are hidden charges out of using their grills and other things and we really did not expect this). I would recommend you to Nanay Benilda’s homestay, and if I am not mistaken, she has the most popular homestay there because of its good service. Actually, we booked a room at her homestay but canceled it as soon as we got there. Nanay Benilda is very kind because when we bargained her rooms, we got a deal that we will be using two rooms for only P1,000. One room has an air-con and the other one a fan room, knowing that it’s already summer (we visited Dasol last March 2012). Imagine that, two rooms for only P1000 versus a kubo for a BASE price of P1,200? A big NO NO to the kubo! By the way, Nanay Benilda’s contact number is at 09105641382. Sunrise at Tambobong Beach in Dasol. You will never get to see the sunset so grab the chance to see the sunrise. After we have settled our things, we went to the beach side for a brisk walk. We were a bit disappointed with Tambobong Beach—dried woods and leaves scattered, the sand is not white but more of a DIRTY WHITE sand, it was high tide when we visited the area, and there are a lot of sea grasses in the beach. And it only means to say one thing—the beach is not meant for swimming. Other tourists talk about Tambobong Beach as if it were a super nice beach, but I tell you the truth, it is just an ordinary beach so minimize your expectations. I am not sure though if they super edited their pictures of Tambobong Beach, haha. What we enjoyed when we walked the beach front was getting some corals and shells for souvenirs. So for other travelers or tourists planning to go to Tambobong Beach, please do not expect a clean and super WHITE sand beach. But you don’t have to worry, what makes Dasol a haven for tourists and travelers are the islands near it—and there you are going to see the WHITE sand beach you are dreaming of. Plus that endless swimming experience you ever wanted. We enjoyed the night especially that we ate grilled squid and grilled something I don’t remember now. It’s fun. The feeling that we were so far from the city really makes it wonderful. Never mind about the unmet expectations, what mattered most is the experience we had. The next day, we woke up early and walk to the beach. It was already low tide, but the sands still look ordinary. We didn’t see the sunset the other day but luckily we saw how the sun rose from the horizon and it’s soothing. The air was fresh and cool. After a few minutes of walking, we little by little knew that the beach was actually a fishing ground (that’s why I don’t recommend tourists to swim the area). And we saw a big catch from the fishermen! Awesome, we saw a squid more than two feet long! A real big catch from the fishermen of Dasol, Pangasinan! As the sun went up, the beach looks nicer to the eyes. Yes, the sands look whiter now because of the sunlight and the waters near the shore somehow turned a bit turquoise. Now I know what the other travelers saw, but well it is not still what you would expect with a paradise-like white sand beach. But at least you are on a white sand beach! After a few hours, we decided to explore the other islands near the beach. We hired a boat to the islands, and man this is what I was looking for in Dasol—it’s hidden paradise. Forget about Tambobong Beach—it’s just ordinary, remember? But don’t forget about the islands near it—for sure it will exceed your expectation once you get there. I promise! The beach is indeed not white but creamy white. The seaplants in the water means the beach is alive and healthy, that doesn't mean you can't swim though. Just wait for the tide to come up and you're good to go. Regarding the dirtiness of the beach; those are but natural since this is really not a commercial beach where "dirt" is constantly swept by resort owners. Yes, it is still undeveloped, that's why I mentioned it in my first post that tourists should not expect it to be a super clean beach. The color is somewhat creamy/brownish more of a soil/dust color, unlike Santiago Beach in Camotes. Yes we saw that one. Somehow in front of Nanay Benilda's homestay it was clean. But it was low tide at mukhang grassland yung beach hehe when we visited the area...ang tagal naman antayin nung high tide. So we decided to visit Culebra/Collibra Island and there we really enjoyed swimming!